Laura Mitchell is a medievalist whose main area of research focuses on charms and other forms of folk magic in later medieval England. Her research interests also include book history, manuscript culture, books of secrets and recipe collections, and their transmission. Laura manages the Facebook page and Twitter for The Recipes Project. She sometimes tweets about medieval things @medieval_laura. 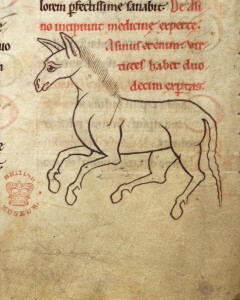 For some reason animal charms in the medieval record are a rare breed. Secrets literature, magical experiments, and natural magic abound with animals as the subject (texts on virtues often focus on the special properties of animals like snakes or eagles) and sometimes as the ingredient (as in my previously discussed directions to become invisible). 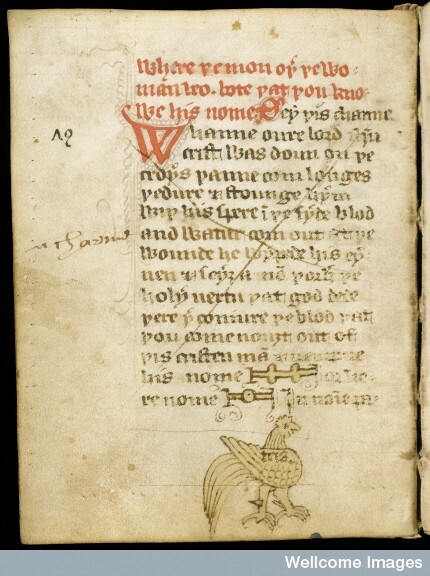 However, in my research on fifteenth-century English manuscripts I’ve only found fifteen manuscripts containing animal-centric charms so far (compared to over 100 manuscripts containing medical charms). Most of the surviving charms for animals are veterinary charms for horses, usually to cure farcy, a form of glanders. Glanders is a debilitating disease that affects the lungs and respiratory tract of horses, mules, and donkeys. It usually results in death in weeks if not days and the bacteria responsible is also transmissible to humans. Given the double threat of loss of animal and human life, it’s no wonder that farcy dominates the animal charms. 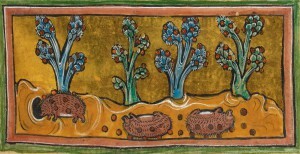 Other goals of animal charms include keeping rats and other pests away, catching rabbits, protecting livestock such as sheep and pigs, and curing or protecting against dog bite (sadly my favourite Old English charm for a swarm of bees does not seem to have a late medieval English counterpart as far as I know). 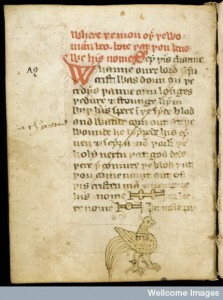 When animals appear in secrets literature or natural magic instructions they are more commonly being put to use in some way – either bits of them are being consumed or burned or spread somewhere for their inherent magical properties, or someone is trying to catch them (presumably to eat them). However, the animal charms, even with this small data-set, fall into the same general patterns that appear with charms for humans: curing or preventing diseases and protecting one’s property from outside forces. Although only a small number of animal charms survive, they are important to note as examples of the diversity of charms that existed outside of the medical corpus and as a fascinating glimpse into the medieval mindset. At the end of the Middle Ages the farm was very much the backbone of the economy and it was vitally important to landowners to keep their properties in good condition. Horses in particular were expensive animals to buy and maintain so it makes sense that surviving charms would focus on their well-being. Hopefully as scholars study more manuscripts and discover more charms we will be able to increase this small but important corpus of charms. We are very pleased to be hosting History Carnival #139 at the Recipes Project this month! We have a wealth of interesting posts to show you this month. Education and the teaching of history has been a hot topic recently. Sean Creighton at History Matters reflected on how Black History Month has evolved and what constitutes the study of British Black History today. Our own Recipes Project blog devoted the month of September to the teaching of recipes, which ranged from early modern to Canadian history. In a related vein, Richard Blakemore offers his thoughts and criticisms on The History Manifesto, Cambridge University Press’s first open access book. Bridget Lockyer at the FWSA Blog presented the results of a workshop on teaching women’s history in the UK’s new curriculum that was run with students and teachers at three schools in York. Women in history also featured in several fascinating posts this month. The writers at All Things Georgian brought to our attention the 1737 book, “The Whole Duty of a Woman”, and its recipes for just about every day of the year. Maritime historian Joan Druett has provided us with a glimpse at Mrs. Alexander’s maiden voyage on the James Craig in 1874, including giving birth! Kathryn Robinson, also at History Matters, looks at the legacy of the London Tube during the Blitz in the Second World War. Medical historians have been producing some excellent posts recently. 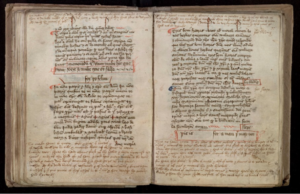 At the Notches blog Katherine Harvey has been looking at medieval views on masturbation and the idea that prolonged celibacy could be a risk to a man’s health! Yikes. Lesley Hulonce has written a fascinating post on the earliest institutions for disabled children in Victorian and Edwardian Britain and the assumptions society placed on its inhabitants in terms of their education and livelihoods. 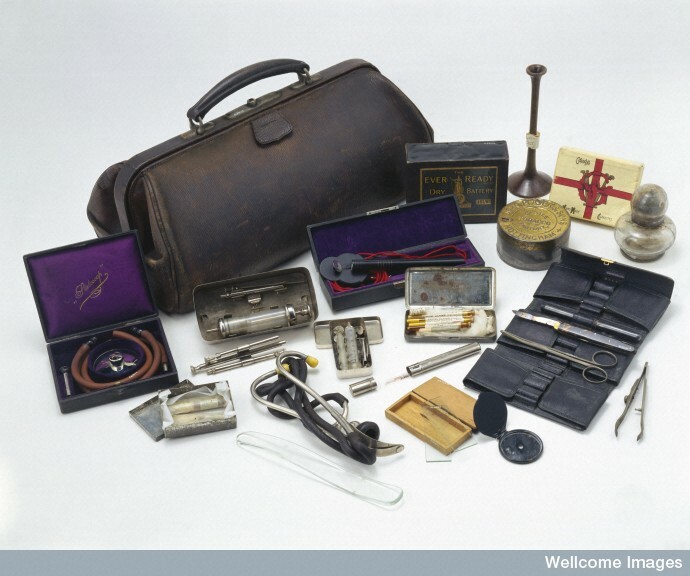 Leather doctor’s bag with contents, English, 1890-1930. 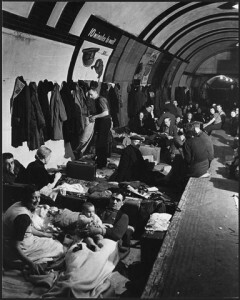 Wellcome Images. Åsa Jansson tackled the thorny and ever popular topic of retrospective diagnosis with her reflections on the recent conference, “Gloom Goes Global: Towards a Transcultural History of Melancholy since 1850” held at the Univeristät Heidelberg this past October. Ed Darrell has been looking at the use of DDT to fight malaria. Jacqueline Antonovich at Nursing Clio, wrote of her experience in the archives and surprising insights that can be gained from material culture. Suzie Grogan has written a really interesting guest post for The Quack Doctor on home remedies for shell-shock after the First World War. Alun Withey put the beard and masculinity in its historical context as beards have becoming increasingly popular over the past few years. Joanne Major at All Things Georgian tackled a grim mystery from the 18th century – that of Oliver Cromwell’s missing head. October provided a number of posts on one of my favourite topics – historical food! The Sloane Letters blog returned after a brief hiatus with a post determining once and for all that Hans Sloane did not invent milk chocolate (alas). Liz Adams at the Rubenstein Library tested an 1899 recipe for a dairy free ice-cream made from nut butter. While she concluded it may not be ice cream by modern standards, it was delicious! Over at Not Just Dormice, Lisa Lodwick explored the enduring use of coriander and its immense popularity in ancient Rome. 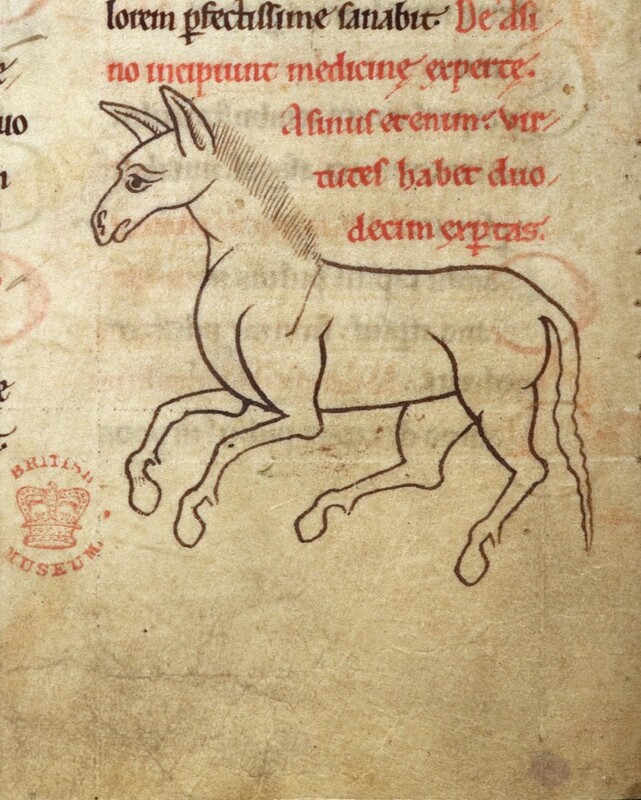 Rochester Bestiary (England, c. 1230): London, British Library, Royal MS 12 F XIII, f. 45r. 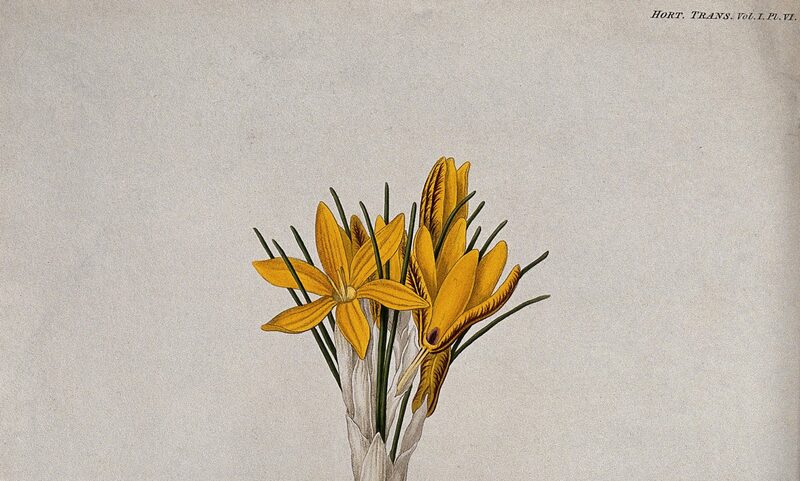 Source: British Library. As a medievalist I would be remiss if I didn’t include some more posts from that quarter of the internet. Jonathan Jarrett tells us how to start a saint’s cult. 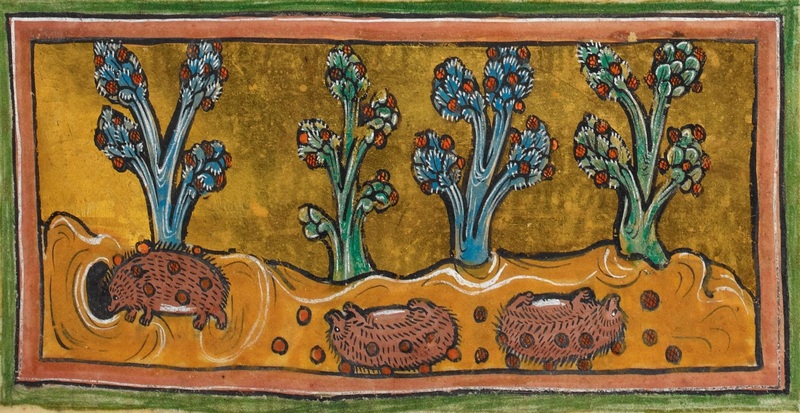 Julian Harrison at the British Library’s Medieval Manuscripts blog, meanwhile, tells us how to be a hedgehog. 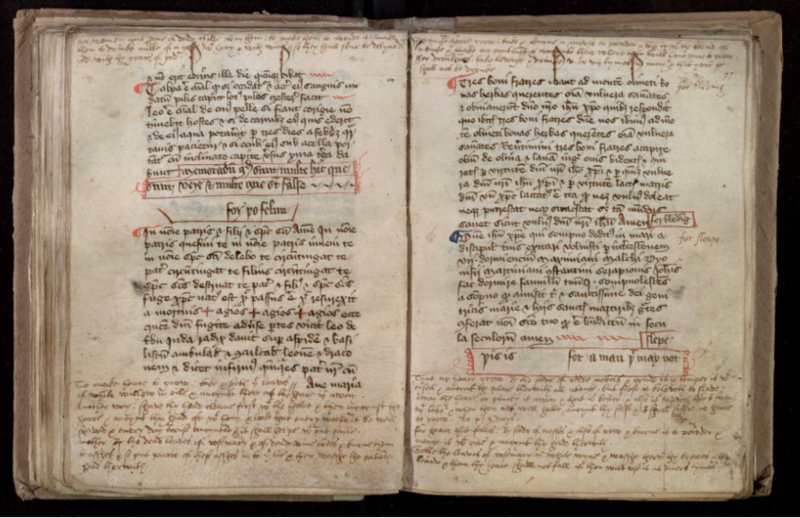 And Erik Kwakkel gives us the skinny on bad parchment in medieval books. Finally, what better post to end October’s Carnival on than Donna Seger’s post on the image of the dancing witch! We hope you have enjoyed the posts in this month’s History Carnival! The next History Carnival will be hosted at the Imperial and Global Forum on December 1st.